Fortnite Season 7 is here, which means that there’s a brand new set of Battle Pass Challenges to complete. This time around, the challenges are all relatively simple, and if you’ve bought into the system before, you’ll immediately recognise most of what Epic has to offer in the new season, although there are a few relatively minor tweaks to the formula. Two of the challenges, Zenith and Lynx, relate to the progressive skins that you unlock immediately as soon as you purchase the battle pass. They both level-up as you earn more XP, with outfit and pickaxe changes appearing at alternate milestones. For example, you’ll earn Lynx rewards at 10,000 and 30,000 XP, while you’ll get Zenith upgrades at 20,000 and 50,000 instead. 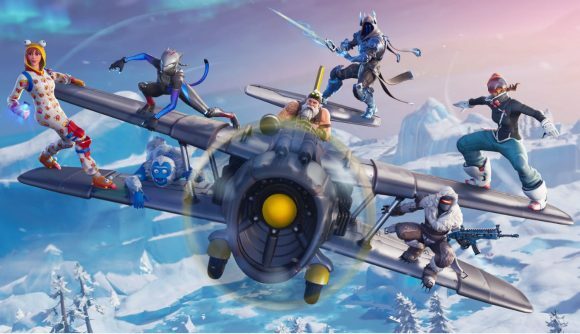 The third special Fortnite Season 7 challenges are snowfall, which task you with completing all of the weekly challenges from any given week. Getting through all of the challenges from week one will net you a reward, getting through the week two challenges will earn another, and so on. A major change, however, is that this time, you’ll earn the mysterious Snowfall skin after completing 60 weekly challenges. In previous seasons, that skin unlocked after completing seven full sets of challenges – a total of 49. Now, you’ll have to complete more challenges to earn it, but you won’t be forced to complete every single week to earn the cosmetic. It’s worth noting that the challenges all comes with a second stage – each Snowfall challenge says “½”, suggesting that once you’ve completed it, you’ll unlock a second task. What that is is anybody’s guess right now, but I imagine it’ll be linked to the loading screen rewards you’ll likely earn.